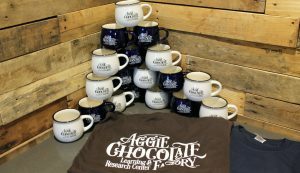 The long-awaited grand opening of Utah State University’s Aggie Chocolate Factory will be held Friday, November 16 at 2 p.m. located at Blue Square complex (1111N. 800 E., Logan) just west of USU’s Football Stadium. The Aggie Chocolate Factory cafe will open and will be serving a dark, frozen hot chocolate and a limited selection of pastries. Steve Shelton, the factory’s manager, has been working behind the glass walls of the newly-renovated space sorting, grinding and roasting beans to the right consistency and taste. He found a formula he likes and will introduce Aggies to his high cacao content chocolate bars, as well as dark, frozen hot chocolate and some pastries at the factory’s chocolate cafe. The factory serves several purposes, but it is first a laboratory for students in the food science program, said Professor Silvana Martini, the faculty member who oversees the Factory. She has been teaching chocolate courses for the past three years. The factory is capable of making batches as small as one kilo of cocoa or as large as 250 kilos. Cacao beans are purchased from small farmers in the Maya Mountain Cacao Co-op in Belize. Research at the facility is expected to impact local chocolate makers, as well as national and international companies. Labs for classes have been taught at the facility since the construction was completed. The Grand Opening will include a ribbon cutting, a few remarks, and some chocolate samples.